Saturday night’s king of smart-casual Dermot O’Leary challenges teams to games of skill in worlds of miniature. There’s some serious money on the line as well with up to £150,000 to be won. Will anyone have the dexterous digits required or will Dermot just end up giving the contestants the finger? It’s The Cube, basically. Although much smaller so it’s more like The Dice, or something. There’s already an app out, which I’ll politely suggest is free to play with a rather shocking 99p charge if you want to buy an extra life (although to be fair you can also ‘share’ the fact the app exists for the same payout). It’s… a bit repetitive, although they’re promising to add more games at a later date (there are only five right now and two of those require unlocking). Anyway, we think the show looks fun but we’ve only got the trailer (and the app) to go on. Let us know what you think of it in the comments. I would guess based on the app the TV show will be 3 games per episode, each starting with £50,000 and a free trial run, err practice, then they either have to buy another practice for £5,000 or commit and either win the pot for that game or lose it all and move on to the next one. Seems like one team per episode may drag a bit if that is correct though, The Cube generally managed a couple of contestants per episode! According to an interview on This Morning, it’s two teams competing- team that banks the most after three games plays a final game to try and win the money. Such a poorly produced show, no tension and no drama. Shame it could have been good. I had high hopes for this – but this has been really boring so far. Wow what a way to drag a show out. Can’t say I’ll be back again for this one. Lost interest after 10 minutes started playing YouTube on my phone. It’s like an even slower rubbish Cube. Yeah I think the surprise for me is that other than the final, I don’t think it really felt tense at all – I think the irony of using Brian Blessed rather undercuts it all. I found I didn’t care all that much about how well they did. It all felt a bit ponderous but the payoffs weren’t all that. One guy didn’t seem to play any of the games, which feels like a bit of a misfire. I think the sets are great and there’s certainly some skill and wit gone into them, but when they start repeating I’m probably out. Yeah, that’s going to be the biggest gripe of this show that someone can get a share of the money and not have to play any of the games. I WOULD have said that each member of the team should have to win a game each, but if someone gets eliminated, that’s no longer possible, so I’m not sure how they could have got around that in any other way than they have. Honestly this was rather entertaining. it felt like the 90’s early 00’s family friendly watchable shows which was a great era for gameshows. This can easily entertain all members of family, the press or practice bit added some tension, based on audience reactions wouldn’t be surprised if there is at least one person who presses the button after failing the practice game. However it still needs some work, there was one person in the team who never played any games so he basically got money just for being there. should be some kind of in game limit for how many games each member can compete in. Also was expecting the final game to involve teamwork somehow but it seemed like another version of the previous games. The not pressing the side game could work as a team game. Make it a relay race of sorts. So small fortune is good but does need some work. John R has pretty much nailed how it’s played, but I’ll expand further. A team of 3 is tasked to complete miniature games to bank money. The team must complete 3 games in order to progress to The Final to win whatever is banked throughout the show. For each game, the player chosen is spotted £50,000 and is given a free practice at the game, same as the Trial Run on The Cube, no penalty for failure or prize for winning. Beside the podium for the game is a red button. If the player presses it, they are in live play, or they can elect to have another practice run at the game, costing them 10% of their bank (£5,000) each time. If the player is in live play and fails, they are eliminated from the game, all 3 eliminated means Game Over. Should the team win 3 games, they progress to The Final to win their entire bank, played on a replica of the Small Fortune studio with a 10cm metal pole in the centre. The player must raise a tiny briefcase with a metal ring on it up the pole without touching it to win the bank. As with all the other games, they get 1 free practice run and then they can elect to enter live play by pressing the button or having another practice run, again at 10% of the bank a pop (e.g if the bank was £90,000, a further practice run would cost £9,000). I would have liked to discuss what games were shown, but that can be considered spoilery for those who haven’t watched it yet, so I’ll refrain for the moment. NBC needs to pick this show up as soon as possible! I was pleasantly surprised by how good this was. This was a lot more compelling, and less gimmicky, than I expected from the ads, and the structure of only one “real” attempt makes it a lot more tense throughout than The Cube. Thw show wisely uses the miniature sets to add flavour to the games rather than being dwelling on them for too long, which would have been an easy trap to fall into given the obvious effort put into making them. The show nicely fit the hour slot without feeling excessively padded, although, as presumably they are airing the best episode first, we’ll have to wait and see if that’s the show or just this episode. Do they not pilot shows anymore? So many faults with this – the practices make boring TV, there is no progression in the money on offer, there is seemingly no point in it being teams of three and it is just dull. Would be better to strip out the practices and have two competing teams instead, first to complete each game wins. Make it best if 5 then in the final you basically get one go per player left. Pacing is key though – yet another format which might sustain interest moving along at a decent pace for half an hour but not dragged out for an hour at a snails pace. Also thought it was poor there was no financial penalty for losing a game. The replacement game should be capped at where they left off, which would also discourage them from using too many practices. They did have a non TX pilot for this. I will say, the sets look great though- props in that department. Logical, clean, well-produced, somewhat tense and just clearly enough tongue-in-cheek that I think the tone worked OK. Brig nailed it on Twitter that the show clearly feels unambitious; the context of what we’ve had already works against the show. If this had come ten years ago and The Cube had come today then I think we’d have appreciated both shows more. At the very least, show this on a network which isn’t still so strongly associated with The Cube to make the comparison less obvious. Not one I would expect to see in next year’s poll, either positively or negatively. I quite liked it. It had shades of Moment of Truth about it. But it didn’t quite feel evil enough. The amounts read out in the trailer at the end seem to indicate people found it quite easy overall. If they get high amounts in game 1 and 2, like tonight, game 3 almost becomes a “just get through at any cost” event. I don’t understand how the pacing will work if a team romp through the games. If the edit runs long, you know they didn’t fail. In truth, this would benefit from Cube-style pacing, but ITV don’t like that. I am a bit torn. On the one hand, I think the scale sets do a good job. On the other, I’m thinking “The US get Trojan Wars, we get… this”. Yeah, this would be much better if games could go across 2 episodes in the style of the Cube or Millionaire. Interestingly I think it ran short tonight because i’m pretty sure the rugby overran a bit, but SF still finished around 7:55. Actually, I suppose a valid round three tactic is to just deliberately stuff it up if your pot becomes too small provided you have players left and hope for an easier game next time. Whether this was built in and accounted for I don’t know. Exactly – these sort of things should have been identified before they got to air. There seems no consequence to losing a game, especially as there is no particular advantage to having three in the final. Nothing worked for me at all, seemed pointless having a practice go at the games since they seemed set up to be 50/50 as to success/failure anyway no matter how many practices you had, then why turn my entire TV screen a weird shade of blue for their actual go?! Is Brian Blessed also short of a few quid these days?! The Moment Of Truth was much more fun , and until they started tweaking the format you got to see THREE sets of contestants (well families) per episode, our Cilla couldn’t bear to let the kids go home empty handed even if their parents were rubbish on the night though, plus it had a revolving sofa! If this manages to run for the next 5 episodes in the same Saturday 7pm slot I’ll be amazed to be honest! I thought The Colour of Money is a good, simple concept runied by the fact that it was shouting “THE MOST STRESSFUL GAME ON TELEVISION” at your face constantly, the X Factor style sob-story clips and one big problem with the actual rules. The randomly generated “target” should have been a target not a limit, making it “you’ll go home with at least this, or nothing” and also getting rid of the problem where the grand finale of ITV’s big Saturday night gameshow is just waiting for a number to pop up on the screen. I am pritty sure they did air the final episode of The Colour of Money. I think it was on a Sunday afternoon or a Bank Holiday Monday. I think it was planned in the schedules at one point for around those times, but even then it got cancelled in favour of a film or similar! From recollection, the missing episode had a huge win in it, I think £80K. I only remember this because a good friend of the winner told me (at an audition for the first series of Divided). It was the lady in the opening montage who says “I’m going to go with silver” but we never saw. It was Mark Durden-Smith hosting the pilot. (I saw the pitch tape during an audition for that.) The set was completely 360-degree circular and had no audience. There was an opening round with six contestants bidding anything up to £100K and whoever asked for the most money got to play the game. If they fell short and there were machines to spare, the idea was that the next bid along could take over the game from that point, but I recall the (very lovely) 12 Yard audition staff not really being very sure about their own format in all fairness. In the event, I think they turned a page on the whole production and they binned the contestant shortlist (which I was on, tch). I also remember only three other people being at that audition, while In It to Win It next door were trying to sift through a hotel lobby of about 100. I never knew this before, this is interesting. Do you prefer the format that was finally used, or the version in the pitch tape? The last episode of TCOM was scheduled to air, on a Friday early evening (in or around The Chase slot) in the dead zone between Christmas and New Year 2009. It never aired, and I think a Midsummer Murders took its place instead. For what it’s worth – I found it alright. As others have said, packaged almost begging a US network to pick it up. Tarrant tried his best with it. Would have worked better as the ’round for the money’ played by the winner of a knockout quizshow before it. I think some of previously unaired episodes were on Challenge at some point, but I don’t remember which episodes specifically. Episode 7 is on YouTube. The first two episodes are on YouTube too, both in five parts – including “Cyan Man” Ryan. Watching it now, I can see one other obvious flaw: Chris Tarrant doesn’t chat with the contestants enough or have much fun really, and that’s the thing that he’s best at so it’s a big waste of a great host. If the most excited man on telly looks bored, then there’s something really wrong with your show. I remember seeing somewhere that ITV originally wanted someone else to host (can’t remember who) and they only went for Chris because he wasn’t busy. It does have some good points, the set looks like it could still be used now 10 years on and it would still look modern. And, er… That’s all I can think of. At the time I had the idea of asking the contestant general knowledge questions, and if they get it wrong their number of machines left goes down, but I’m not so sure now that would be a good idea. Mark Durden-Smith hosted an unaired pilot, didn’t he? Also, UKGS suggests that Millie Clode’s role was originally taken up by a man – if true, I guess ITV and 12 Yard decided they wanted to inject some glamour into the show before the series began. 3.2m last night for ep 1, which is cautiously OK I think. It was hammocked between The Voice UK and the rugby, so I’d disagree there. That’s a lot of people turning over and back again. Apparently closer to 3.5m. Not that that makes it a great deal better, but interestingly I gather it beat The Greatest Dancer, deliberately designed to be a youth attractor, in the demo and overall as well. The general consensus seems to be it outperformed what it’s critics were suggesting. As we always say – one episode is not a trend and I suspect it will go down (I can’t see me sticking with it long) but it might surprise and at least hold. Although I can’t see it. The Trial Runs, of course, were the best bit of The Cube, weren’t they? Said nobody ever. There is very little to be gained from practising any more than twice. The games do not lend themselves to converging upon a 100% skill rate. The “oh I should have made that my actual go!! !” reaction isn’t really there. A win should be a win. Make them “buy” up to 10 attempts up front. Then they begin ploughing through them and stop as soon as they win or go out having burned them all. You can then laugh in their faces for buying 7 attempts only to succeed at the first, thereby needlessly urinating away £35K. The timewasting decision-making goes away and you can probably fit another game in. Also, stagger the payout per game for goodness sake. I quite like this idea. You should go into development Little Timmy. Although it does mean you’ll have to drop ‘press or practice?’ as the catchphrase that’s sweeping the nation. And makes that button completely redundant. Is a simple change though that makes it more interesting. Alternatively make it £10k a go to half the potential number “practices”. That’s instantly fixed all the big problems! That I can think of, anyway. While we’re here, congratulations to Dobs Vye of Babushka fame on another successful greenlight. The app has been updated with a new game, lots…and lots of adverts (I think there may be an option to make it ad free again for a price of course), and interestingly no Brian Blessed now either. You get three lives for your quid as well, which is a thing. Erm, bit of a shock twist coming up in Episode 3! 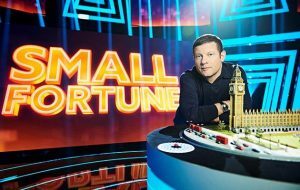 Dermot O’Leary hosts a celebrity version of the game show, with a team comprising Richard Madeley, his daughter Chloe, and her husband rugby star James Haskell taking on challenges in miniature settings to win £150,000 for charity. The BBC better watch out, next week ITV has Richard Madeley playing tiddlywinks for £50k in primetime! Far from perfect, as discussed above, but one positive I will mention is that there was a bigger pool of games than we were fearing. There were still three new games left for the last episode!